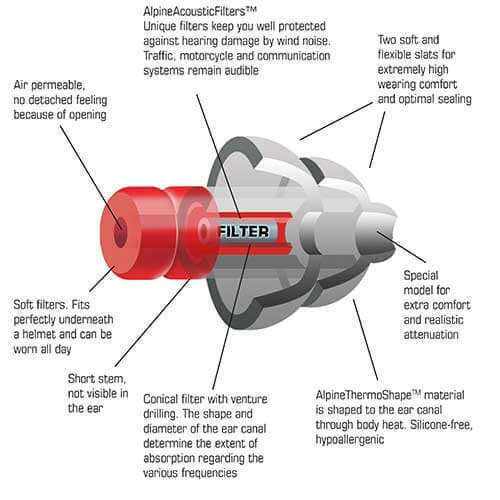 Alpine MotoSafe filter earplugs damp the harmful noise, without an enclosed feeling. Traffic, navigation, intercom and the motorcycle itself remain audible. 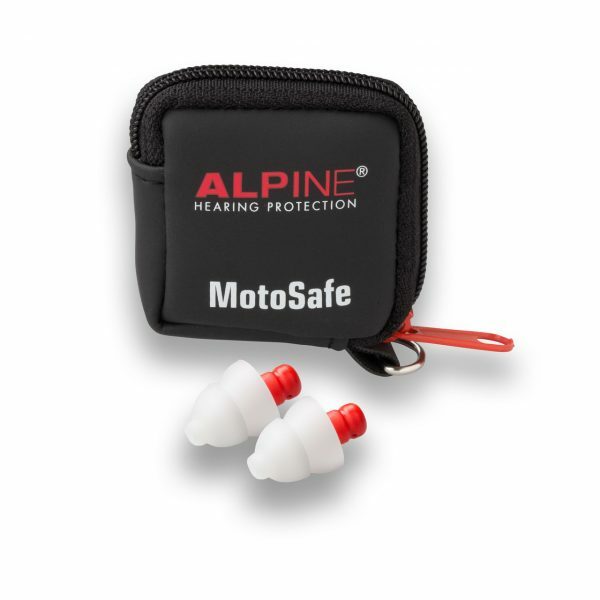 The Alpine MotoSafe Tour earplugs are ideal for example for tours, holidays and on the motorway. 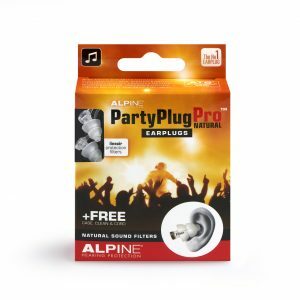 The earplugs have medium attenuation. Would you like to use the earplugs, for example, on the track or with an open helmet? Then choose the Alpine MotoSafe Race. These earplugs have a heavy attenuation. Would you prefer to have a choice of medium or heavy attenuation depending on the situation? 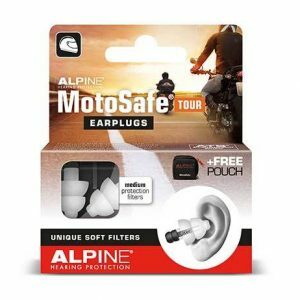 The Alpine MotoSafe Pro consists of two complete sets of motorcycle earplugs: one set of MotoSafe Tour and one set of MotoSafe Race. 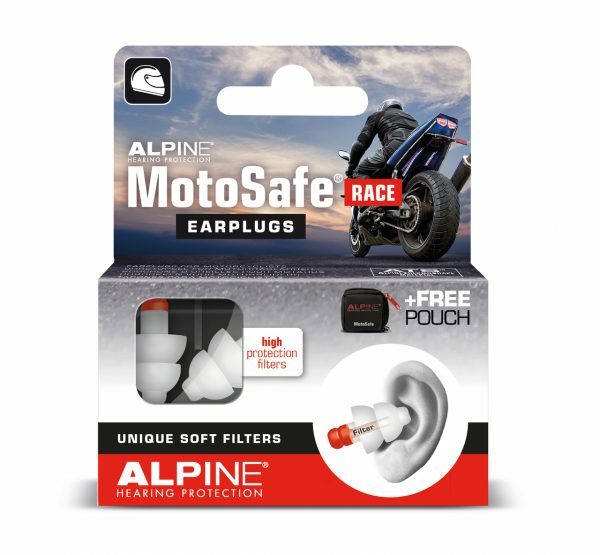 With your Alpine MotoSafe earplugs, you receive a handy storage bag. Simply add it to your keyring, so you always have your earplugs easily to hand. 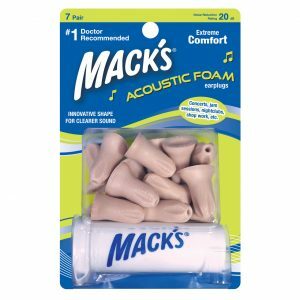 I’ve always worn soft foam earplugs, especially for long rides until a mate got me onto these. Foam earplugs are awesome for blocking sound but they work a bit to well because they block all sound, so I pretty much can’t hear the traffic around me or sirens etc. Anyone who rides know that being aware of your surrounds when riding is imperative for your safety. These earplugs block enough of the wind noise so that I don’t have the buzzing sound after a ride but I can now hear whats go on around me. The wind reduction on these is exactly what I was after. I was worried they would block out too much of everything over the “Tour” version available, but I really wouldn’t want any less than what the “Race” version reduces. Wind noise is about 1/4 of what just the helmet blocks out (Bell Qualifier DLX) but I’m still able to hear cars, talking, and sirens well. They’re reasonably comfortable, I’m not used to ear plugs so I still notice them in there, but they don’t cause any discomfort. I don’t like the little bag. If you store the plugs in there they get little black fibers on them from the material. Its not a huge deal breaker as you can blow/pick them off, it would be nice if it were plastic lined or something. Overall, I love them, and thoroughly recommend them. These earplugs are probably the best I’ve used so far for my daily commute. They’re soft enough so that they stay in place when you put on your helmet. Their noise reduction properties are excellent, like turning down the volume on your Motorbike from “11” down to about “4”. The one thing I don’t like about them is the “one size fits all.” The plugs fit on the larger side for me and because of this I find them difficult to put into my ears. Once they’re in, their large size usually cause pain so I can’t wear them for any longer than 1 hour before needing to give my ears a break. This could just be me though as most other people who’ve reviewed these have not mentioned this problem. If you usually use regular or small size in-ear headphones then you might experience some pain also. I’m hoping that Alpine recognise this issue and bring out different sizes in future releases. Besides this, they are very good and worth the price.